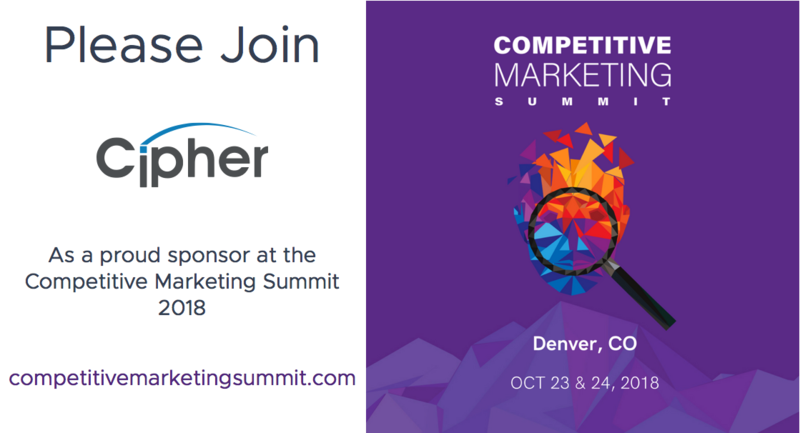 Cipher is proud to announce our participation in the first-ever Competitive Marketing Summit as an inaugural sponsor. This event is designed by product marketers for product marketers and will take place in Denver, CO this October 23 & 24. The 2018 Competitive Marketing Summit is a one-of-a-kind event designed specifically for product marketing, competitive intelligence, and sales professionals representing the high-tech industry. In our role as sponsors, Cipher will host a booth to speak with attendees about their competitive strategy. Be sure to stop by for a quick chat to see what Cipher can do for you! Knowledge360® - The first and only SCIP CertifiedTM competitive intelligence software designed to help CI professionals save time and stay ahead of the competition by collecting, organizing, and analyzing the information necessary to make informed business decisions. Learn more. CI State of Play - Developed in collaboration with James Madison University, this ground-breaking new report provides clear benchmarks for how to structure your CI function based on insights gleaned from the Top 300 companies in the Life Sciences industry. CI has long held a position of value in Life Sciences companies with long R&D cycles and fierce competition. The lessons learned from this industry are applicable to every company facing a highly competitive market. Reserve your copy. And anything else that comes to mind! Whether it’s delivering cutting-edge technology solutions, partnering with clients on research and analysis, or advising the C-Suite on effective strategy, the world’s greatest companies trust us to deliver actionable results. Cipher is a full-service competitive strategy and technology firm. We provide world-class consulting services and technology solutions that help our clients gain and maintain a competitive edge.